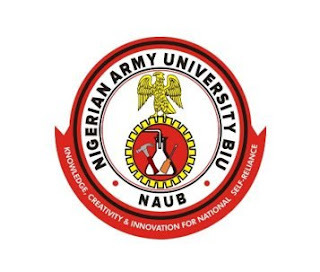 Nigerian Army University Biu (NAUB) First Batch List of Candidates Offered Provisional Admission for 2018/2019 Academic Session. This is to inform all candidates who applied for admission into the Nigerian Army University Biu (NAUB) undergraduate programmes for the 2018/2019 Academic Session that the admission list has been released. 2. YOU ARE YET TO UPLOAD YOUR WAEC/NECO/NABTED etc. ON CAPS. IF YOU FALL INTO THIS CATEGORY, YOU STILL HAVE A BIG CHANCE. QUICKLY APPROACH A JAMB CBT CENTRE AND ENSURE YOUR RESULT IS UPLOADED BEFORE THE END OF THIS WEEK. 3. ALL NEWLY ADMITTED CANDIDATES ARE TO PROCEED TO BIU IMMEDIATELY FOR SCREENING, REGISTRATION AND RESUMPTION. 4. PLEASE DISREGARD ANY SUGGESTION OF BIAS IN OUR SELECTION PROCESS. DO THE NECESSARY THINGS AND YOU SHALL BE ADMITTED. The under-listed candidates have been offered Provisional Admission into the Nigerian Army University Biu (NAUB) degree programmes fo the 2018/2019 academic session. Click here to download NAUB Admission List in PDF. Candidates can also confirm or check their admission status via the JAMB CAPS Portal. All students who have changed their Institution choice to NAUB but are yet to upload their O-level result to the JAMB portal should do so as soon as possible. Be advised that only students whose O-level result(s) have been uploaded to the JAMB portal will be considered for admission. All admitted candidates are to proceed to accept their admission offer and print the JAMB Admission Letter Online. See Also: NAUB Acceptance Fee Payment & Registration Guidelines 2018/2019.